The start of St Edmundsbury Sailing & Canoeing Associations’ Late Summer Series and Double Handers' Trophy took place in perfect conditions on Sunday with a warm, south-westerly breeze. Jon Holmesfjord, sailing a Laser, led the fleet home in the first race but wasn’t quite far enough ahead to hold his position on corrected time and was narrowly beaten by Kieron Adams, Laser Radial, and the Enterprise team of Carl Day and Alan Shaw. In the second race, Jon Holmesfjord got away to another good start and pulled off a convincing line honours and handicap win. Kieron Adams and the Day/Shaw partnership had another close battle with the Enterprise just finishing ahead of the Laser Radial on this occasion. Carl Day and Alan Shaw made no mistakes in the final pursuit race bringing their Enterprise home ahead of Keron Adams’ Laser Radial and Jon Holmesfjord’s full rigged Laser, the latter not quite catching the the slower boats. The win secured the Day/Shaw Enterprise team the Double Handers' Trophy and has left the point scores very close at the top of the series leader board, with nine more races to go. 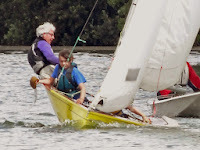 It was good to see the double hander fleet bolstered this week by Nick and Imogen Collier racing a Mirror dinghy; Chris Seear and his grand daughters, Kayleigh and Hannah, sailing a National 12 and Ellis Blackmore and Austin sailing one of Culford School’s 420s. Next week sees the continuation of the Late Summer Series and racing for the Sundae (ed. not Sunday) Trophy.